Following on from one of my pervious blogs ‘The Organised Mummy’. I have found a weekly timetable also helps with our morning routine. Layla will often ask me first thing in the morning ‘Mum what are we doing today?’ Oscar will ask ‘Do I need to wear my sport uniform today?’ To help the kiddies know what’s happening each day of the week I created a timetable. This includes the school program eg. What days they have library, sport etc. As well as any after school activities. As Layla is not reading yet I like to include pictures that she can easily recognise. The timetable seems to change every term depending what we are doing. 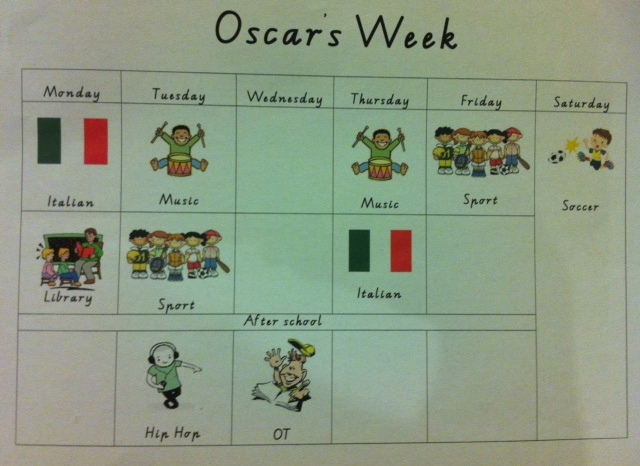 Below is an example of Oscar’s timetable. I have also attached a copy of my Weekly Timetable . Feel free to download, and make any changes to suit your child’s program/activities and print a copy. Once you have printed your timetable, find a place where your child can see it – bedroom door, pantry door or where they hang their school bag. I find this to be a great help!